Posted by americanex in English Club. 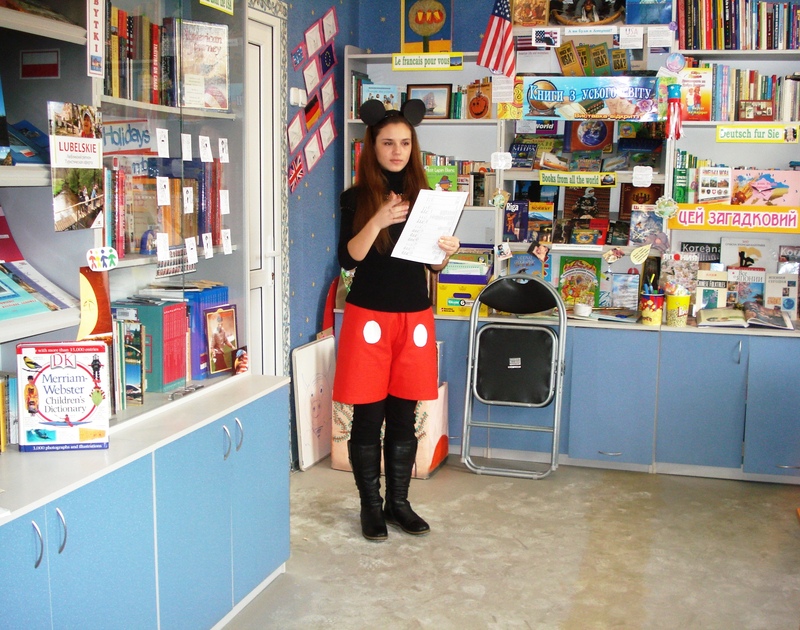 Last Sunday, we dedicated our English Club to talk about Walt Disney. And who reminds us most of Walt Disney? Why, Mickey Mouse of course! See the photos below to see how much fun we had! When I was a little girl in America, Sunday night was a special night. At my house, our family would gather together in front of the television to watch The Wonderful World of Disney. The Wonderful World of Disney was a television program that played movies made by the Walt Disney Company. The movies were always heart warming, funny and perfect for adults and children. The Walt Disney Company has grown bigger and bigger since I was a little girl. It now includes Disney World, Disneyland, Disney Stores, The Disney Production Company…the list goes on and on. Walt Disney was more than just the company he created, he was a man with a dream. When he was young, he studied art. He dreamt of working in animation. Mr. Disney was born in Chicago in 1901 but his family soon moved to Missouri, and that is where he grew up. As a child, he loved art and nature. At 18 years old, he joined the Red Cross and served his country during the war by driving an ambulance in France. When Mr. Disney returned home to America, he packed his suitcase and with $20 in his pocket, he headed to Hollywood. In 1932 he made is first color cartoon called Flowers and Trees. In 1937 he made The Old Mill. But it wasn’t until 1937 that he won acclaim with his full length animated musical feature – Snow White and the Seven Dwarfs. When Snow White was first released, the United States was deep in the Depression. Still, the film made and unbelievable $1,499,000! Mr. Disney’s next movies were Pinocchio., Fantasia, Dumbo and Bambi. Then, in 1954 he launched his television program, The Wonderful World of Disney. His program was one of the first to be televised in color in 1961. Another of Mr. Disney’s dreams was to create a clean, well-organized amusement park. That dream came true in 1955 when he opened Disneyland Park. Let’s talk about Mickey Mouse now – the most famous of Walt Disney’s characters and the spokesperson for Disney World and Disneyland. Mickey Mouse was born in 1928. His first movie as a screen star was Steamboat Willie. It was a “talkie,” meaning, the characters actually talked. This was all new and exciting in 1928! In 1955, Mickey Mouse had his own television show – the Mickey Mouse Club, which included young children who sang and danced. They were called Mouseketeers. To see a clip of the Mickey Mouse Club, click on the link below.Guess who was once a Mickey Mouse Mouseketeer? Justin Timberlake! I have often heard it said that Walt Disney is an “icon” of the America Dream. The success his parks, television shows, cartoons and family fun is equal to no other in the world. We are lucky Mr. Disney followed his dream. Posted by americanex in English Club, holidays, Uncategorized. Thanksgiving is an American holiday that has many traditions. Unscramble the words below to learn about some of those traditions. 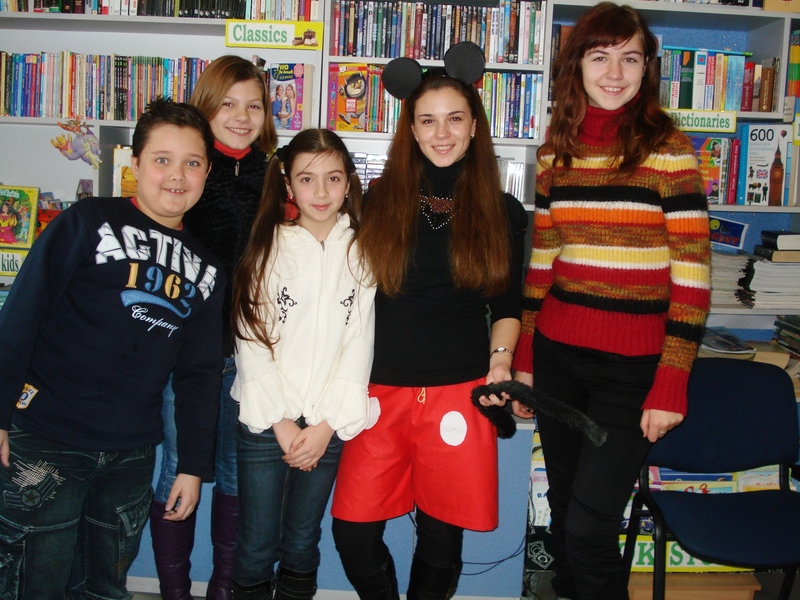 Below are some photos from English Club at the Children’s Library. We celebrated and learned about Thanksgiving. Join us again this year on November 28 starting at 10 a.m.
Posted by americanex in English Club, Peace Corps. School is back in session and guess what? So are the English Clubs! 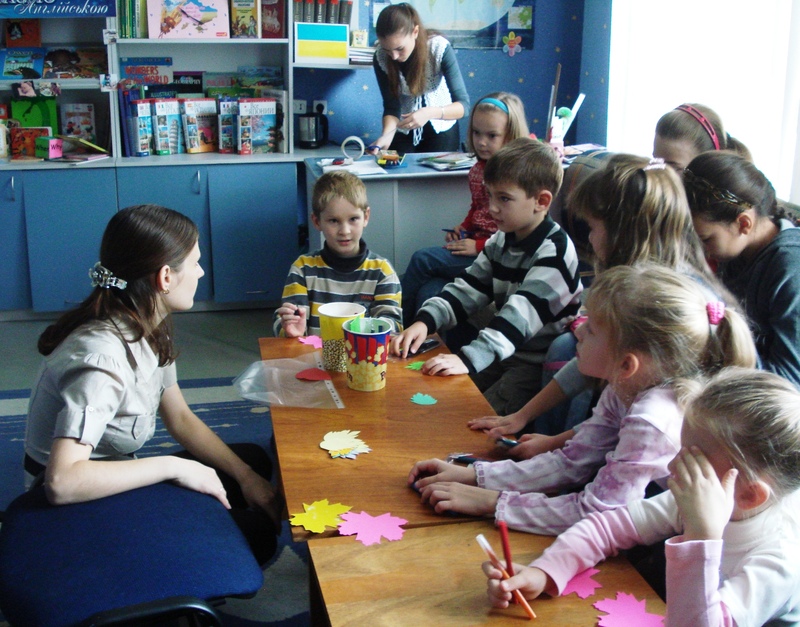 English Clubs have started again at the Kherson Oblast Children’s Library. Every other Sunday, we have three English Clubs – 10 a.m. for beginners, 11 a.m. for mid-level or middle school children and noon for advanced speakers. and the most fun of all was bowling! Join us on October 31 for our annual Halloween Party. There will be lots of games and fun and candy, of course. We hope to see you on the third floor of the Kherson Children’s Library at 10 a.m. on October 31. The Children's Librarian, Ira, talks with students about the seasons of the year. We colored and decorated leaves for our "word tree."